This is our first full day in San Juan, Puerto Rico. Our cab took us to Old San Juan, the original walled city of San Juan, Puerto Rico. Christopher Columbus arrived in San Juan in 1493 on his second voyage to the New World. For Spain, he claimed all the riches of what is now called Puerto Rico. This included gold, silver, gems, and spices, in addition to the first deep water port between Europe and the New World. 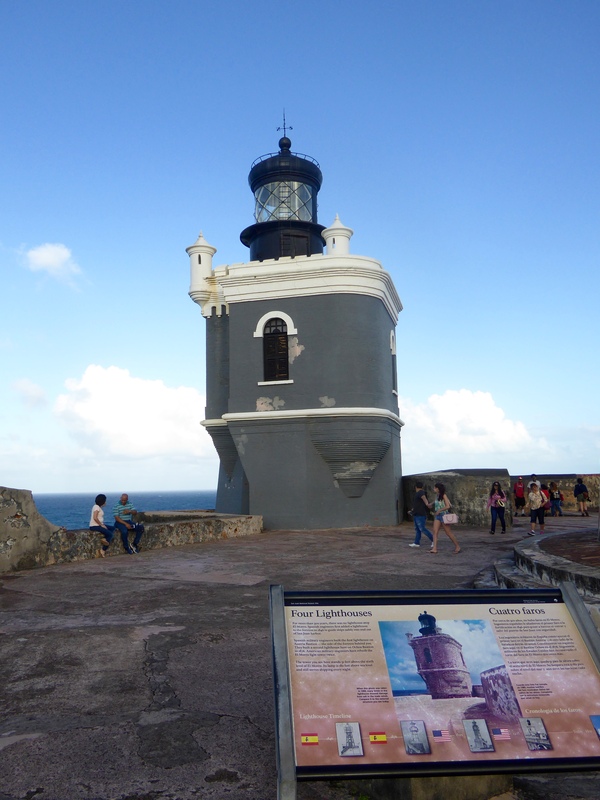 Puerto Rico is a territory of the United States and Old San Juan Historic Site is under the protection of the U.S. National Park Service. There are two old fortresses, built by the Spanish, here. 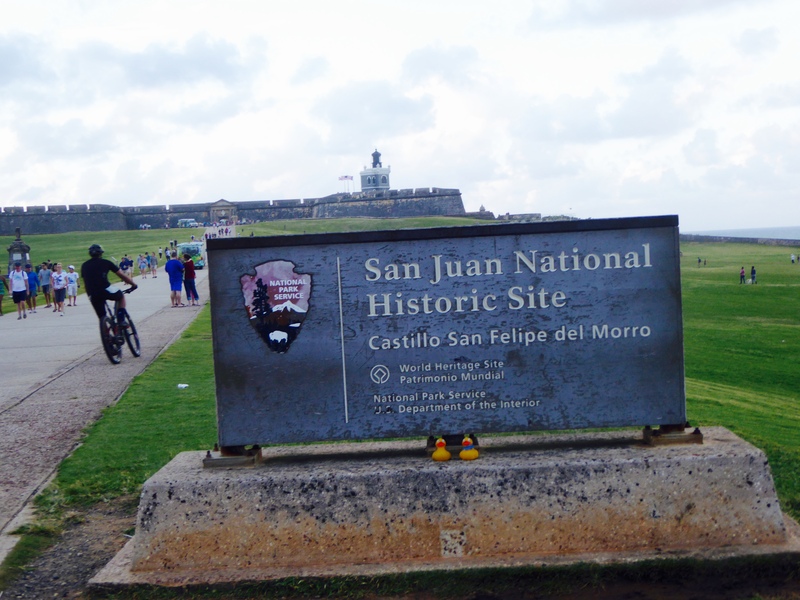 The Castillo San Felipe del Morro was to defend against attacks from the sea. 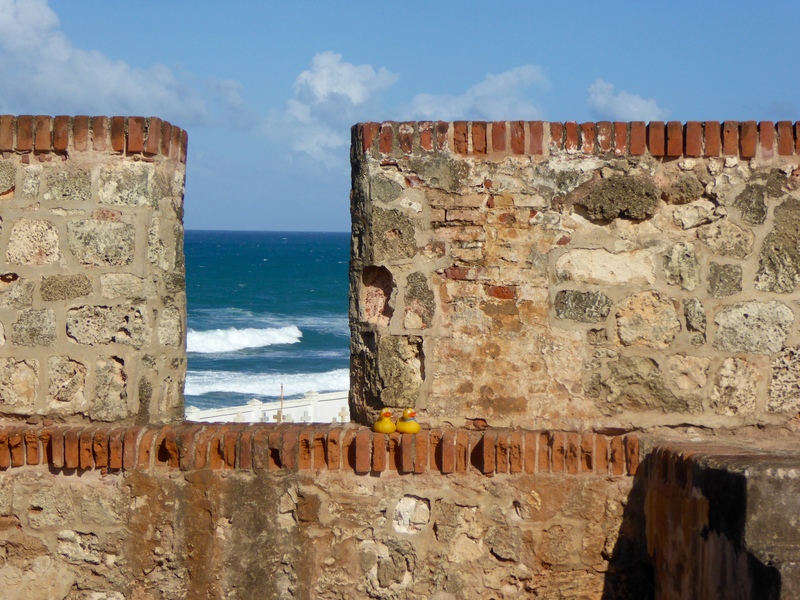 The Castillo San Cristobal, about a 30 minute walk away, was built to defend against attacks from land. 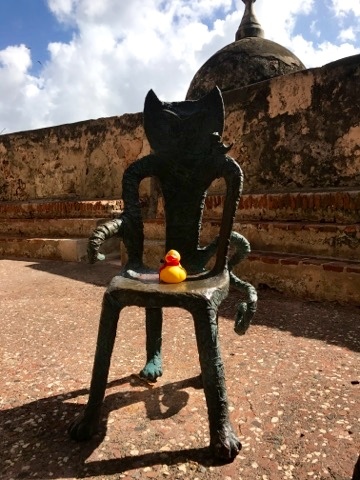 We, the Colorado Traveling Ducks, will show you Castillo San Felipe del Morro today. Here is the sign. 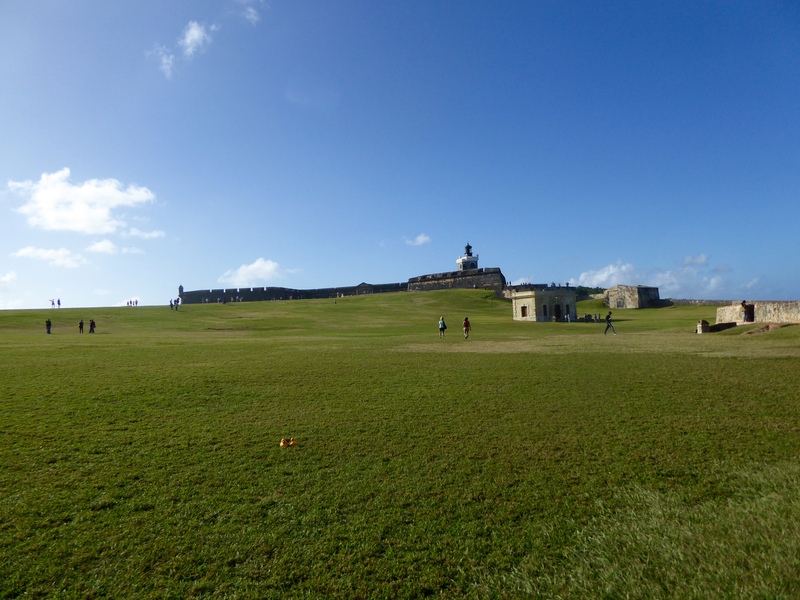 Where is Castillo San Felipe del Morro? We can see the lighthouse in the background, and realize we have a long walk ahead of us. 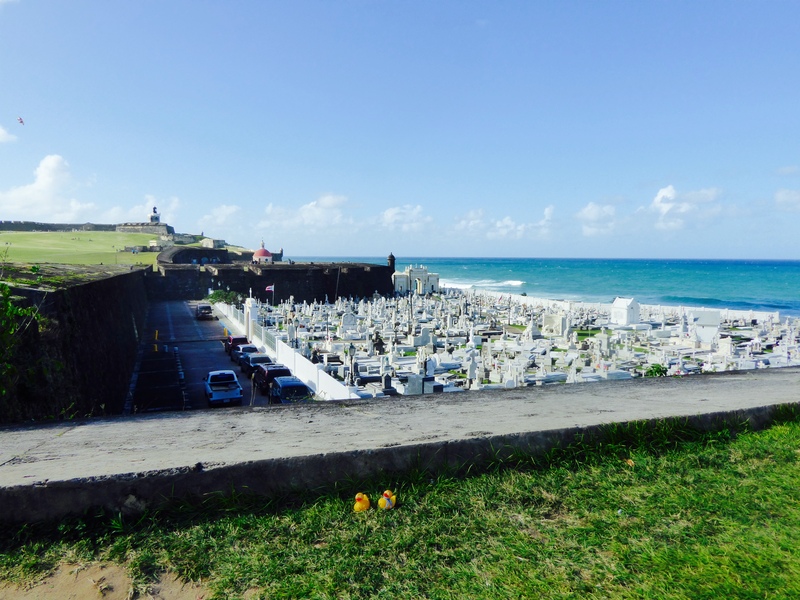 This cemetery was conveniently located on the coast near the Castillo. The city, like many old cities, was protected by a wall. Today we have a peaceful view through that wall. The grass here was incredibly soft in places. This was once a golf course, but we still must keep walking. We think this building, built partially underground is interesting. 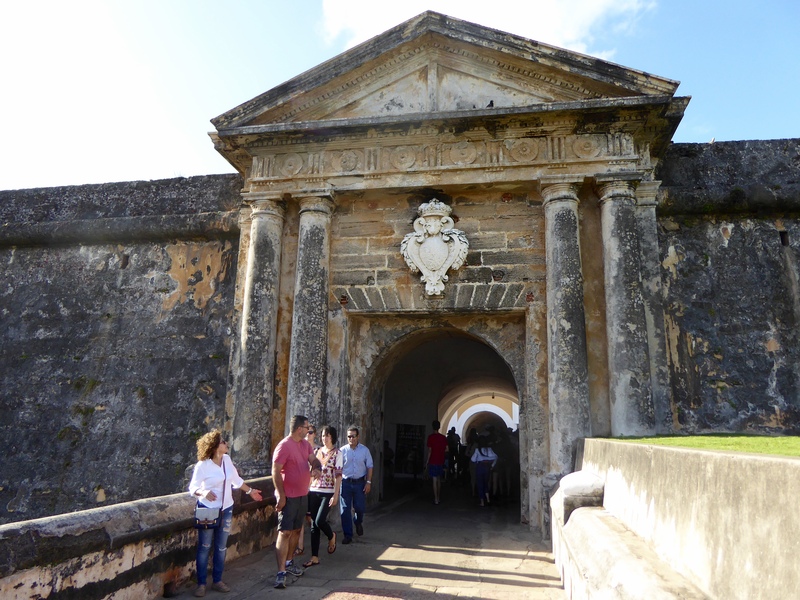 Let’s go inside Castillo San Felipe del Morro. Bucket claimed this chair and seems to be enjoying a short rest. Chair fit for a king. King Bucket? 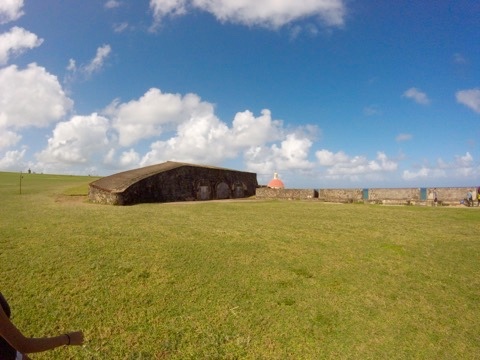 This space, once the living quarters for the commander of El Morro, but later, a place of punishment. 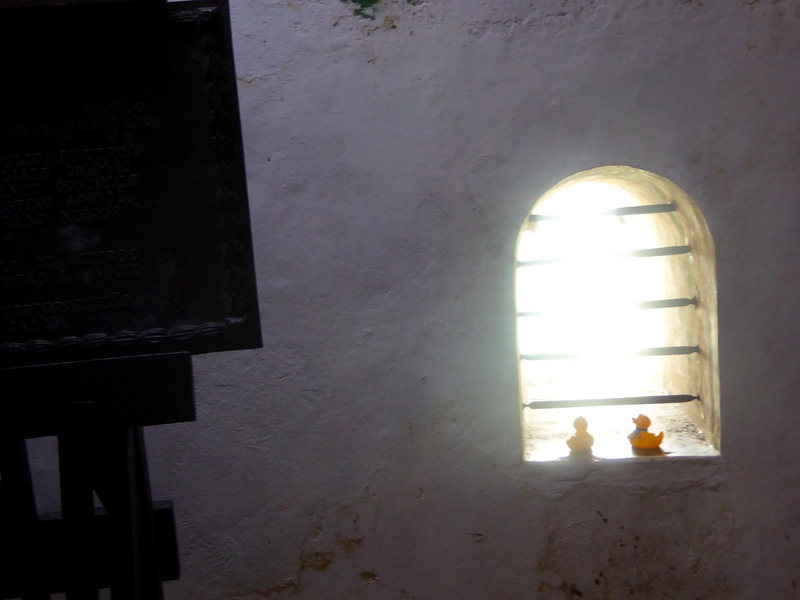 Zeb and Soapy enjoy the view, through the bars, of the sea. Bucket found another prison cell. Bucket and Chip–don’t go inside that prison cell. Don’t go inside there, Bucket and Chip. We found this canon, now inside a room. But it was not always inside this room. This path takes us to the former home of the canon. The canon was pointed through this lookout. We ducks wanted to sit on the ledge, but the humans said it was too windy for us. But we love to watch the water. 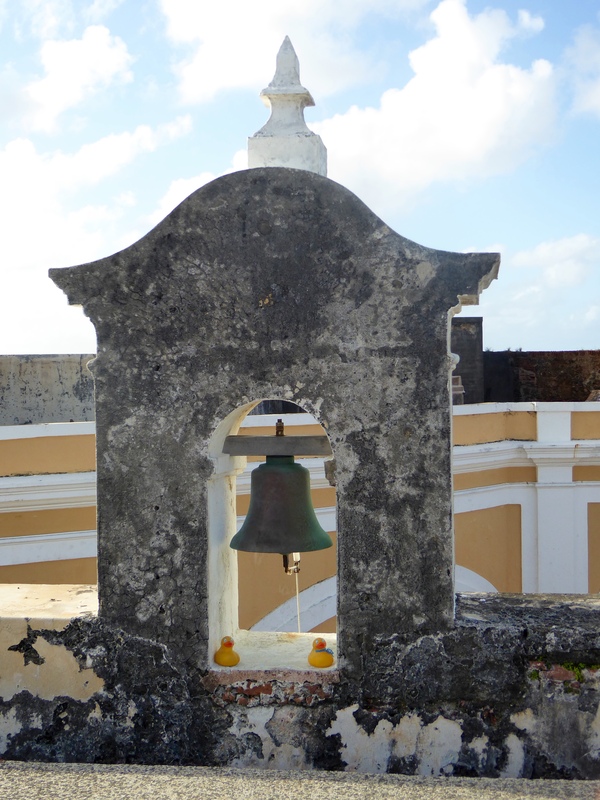 Castillo San Felipe del Morro has six levels and we found the bell on the 6th level. This lighthouse looks pretty new, doesn’t it? It is the fourth lighthouse built here. 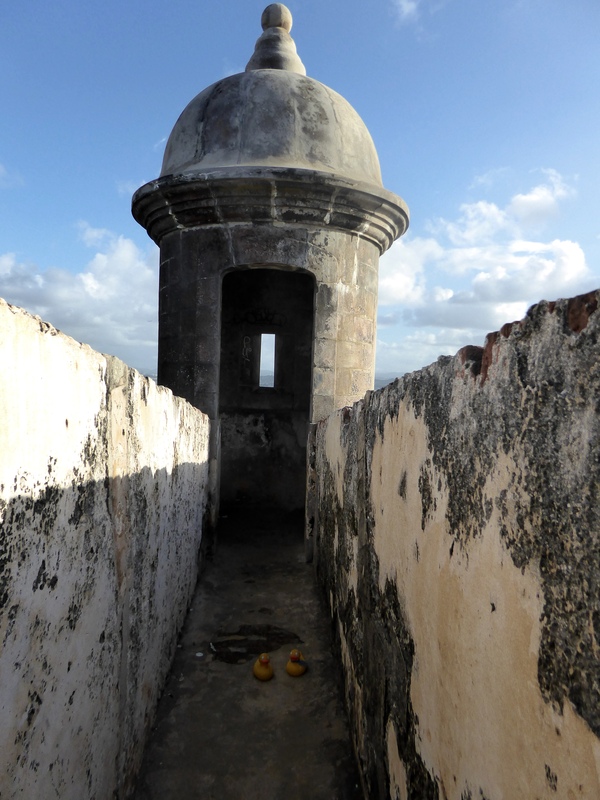 This one is 51 feet above the 6th level of El Morro. The lamp is 182 feet above sea level and this lighthouse and lamp still serve ships every night. This lighthouse was built in 1908. Originally made of bricks, it was restored in the 1990s. 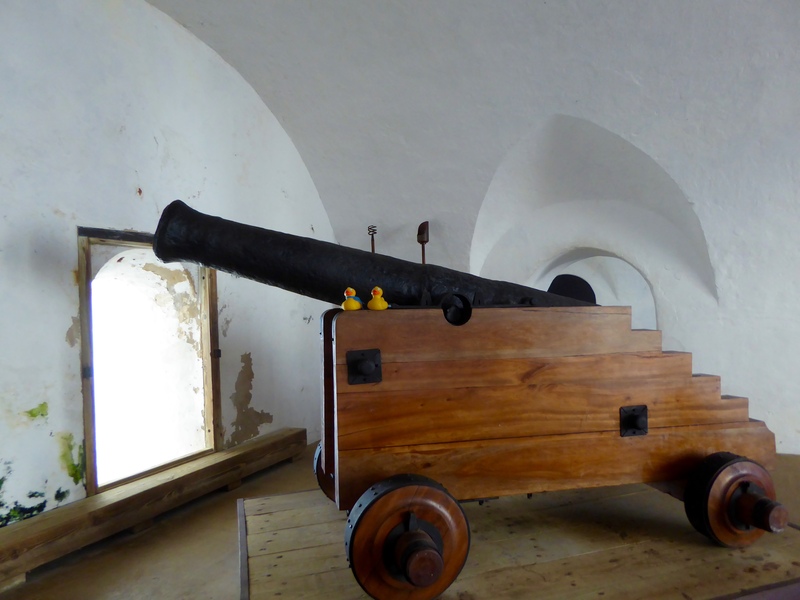 We ducks are impressed by this castle. But we are also impressed and a little frightened by the wind here. We like the sea, but we don’t want to be blown into it and lost forever. The humans kept us safe. 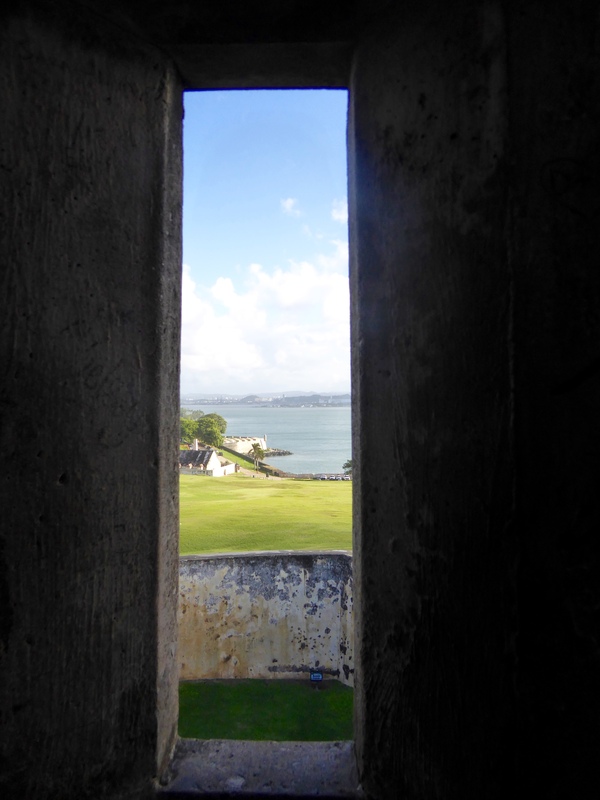 More about Old San Juan next time. 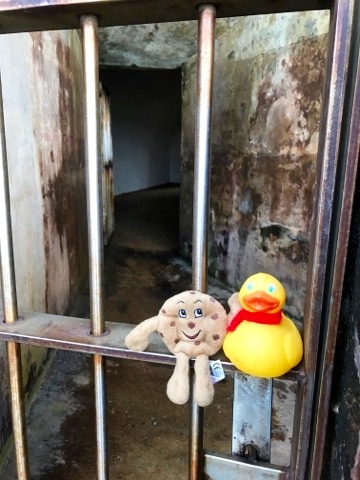 This entry was posted in Caribbean, Puerto Rico, Uncategorized and tagged bell, Caribbean, Castillo San Felipe del Morro, cemetery, Colorado Traveling Ducks, Lighthouse, Old San Juan, prison, Puerto Rico, walled city. Bookmark the permalink. What an interesting place to visit and you got your daily walk in at the same time! It was interesting, and windy. Beautiful, sunny day so walking around was a pleasure. Thanks for reading and commenting. hi!,I really like your writing very a lot! proportion we communicate extra about your article on AOL? I require an expert on this house to unravel my problem. May be that’s you! Looking ahead to peer you.